See this Chapter submission and many others like it in the fall 2018 edition of the Chakett! The Lambda Theta Chapter at the University of Massachusetts Dartmouth has had a great year. Though many Brothers were lost for various reasons at the beginning of the year, our Chapter was not hesitant to fill in the positions those Brothers held. It was intimidating at first, but many of our Brothers stepped up and took on a position, truly growing as an individual as the year progressed. Something I’m particularly proud of this year is our success in participating in the MS Walk. The MS Walk is a national fundraiser whose goal is to end the life-changing condition known as Multiple Sclerosis. Brother Kyle Gagne set up our participation in the event, and we managed to raise over one thousand dollars. It was truly inspiring to see the things we could accomplish working together as a Chapter. In addition, this year we held one of our most successful Alumni events. We call it the “Alumni Games,” where Alumni from the Chapter come and play a few sports against the current Chapter. Per usual, the Chapter lost to the much stronger and older Alumni; however, we had a great showing from both our Chapter and the Alumni alike. It was the perfect time for new Brothers to meet Alumni and bond with them over common interests. 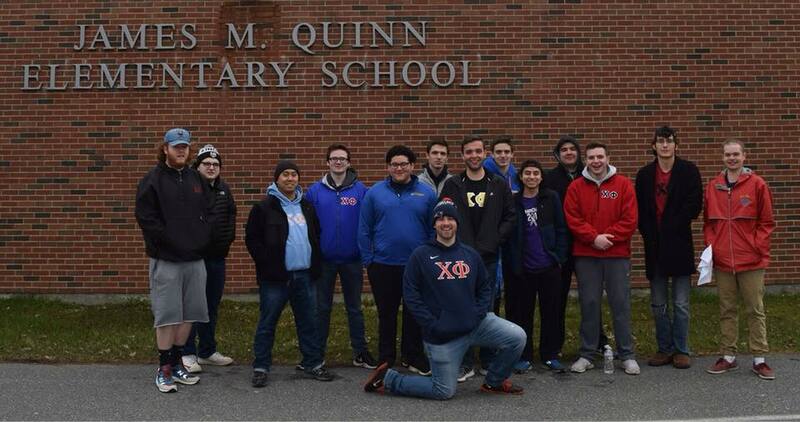 Overall, this year has allowed our Chapter to grow and mature as a part of Chi Phi. Brothers appear more motivated than ever to work towards bettering both the Chapter as well as themselves. Our Brothers show a lot of ambition and truly want to dive into the responsibilities of being a Chi Phi. I am excited and honored to witness these changes, and cannot wait to see what the future years of this Chapter hold in store. I want to thank you for your participation in the MS Walk this year and raising over $1,000 for the cause. I have had MS for 30 years and the term devastating disease only begins to describe it. One must approach any challenge in life with a positive attitude and perseverance which I have done. Support from my loving wife also helps a great deal. I am a 1981 graduate of the University of Georgia and a Brother of the Chi Phi Eta Chapter there. I use a power wheelchair to get around these days but I have season football tickets and love to cheer on the Dawgs. Thank you once again for participating in the MS Walk. Please contact me if you are going to participate again next year and I will gladly donate to your team.